It’s Hump Day: Wednesday, September 5, 2018, and National Cheese Pizza Day, best consumed in Chicago in the stuffed or deep-dish form. It’s also a UN-decreed day, International Day of Charity. I am leaving this afternoon for California, where I hope to see elephant seals, peregrines, and whales, but I have come to work to write Hili, water my plants, and, of course, feed the ducks (if they’re still there). Please be abstemious with your emails to me: no more than one every three days or so (except for corrections, of course). (from Wikipedia): Digital reconstruction giving an impression of Old St Paul’s during the Middle Ages. 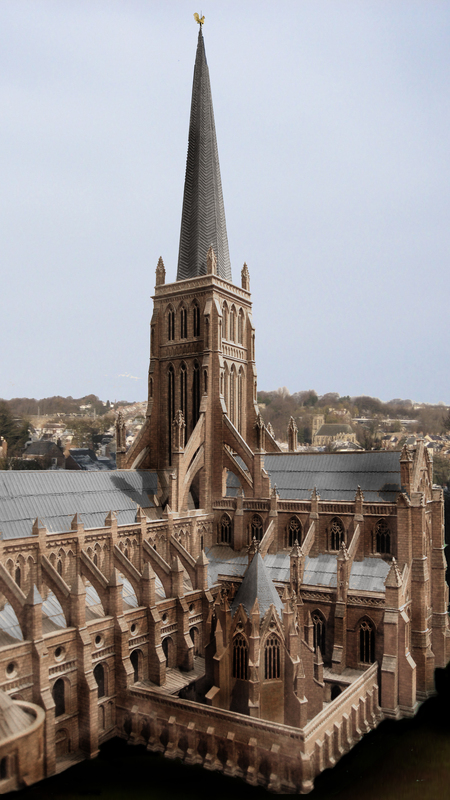 The image is based on a model of the Cathedral in the Museum of London, composited with a modern city background. On September 5, 1969, William Calley was charged with 6 counts of premeditated murder for the death of 109 Vietnamese civilians in the My Lai massacre. Calley hardly served any time (3½ years of house arrest), and now works at his family’s jewelry store in Columbus, Georgia. On this day in 1972, the Munich massacre began: the Palestinian “Black September” group took 11 Israeli athletes hostage at the Munich Olympic Games. All eleven died the following day. Exactly three years later, Lynette “Squeaky” Fromme tried to assassinate President Gerald Ford. She served 34 years in jail, was released in 2009, and now lives in Marcy, New York. Finally, on this day in 1984, the Space Shuttle Discovery landed after its maiden voyage. Notables born on this day include Louis XIV (1638), Jesse James (1847), Cornelius Vanderbilt III (1873), Darryl F. Zanuck (1902), Bog Newhart (1929; still with us), Raquel Welch (1940), and Freddy Mercury (1946). Those who crossed the Rainbow Bridge on this day include Catherine Parr (1548), Crazy Horse (1877), Ludwig Boltzmann (1906), Georg Solti (1997), Mother Teresa (also 1997), Justin Wilson, the Cajun Chef (2001), and Phyllis Schlafly (2016). I used to watch Wilson on “The Cajun Chef” show, fascinated with his schtick and his patois. Here he is making chicken gumbo, and prefacing it with his usual corny story. It’s cringeworthy, I garr-un-tee! 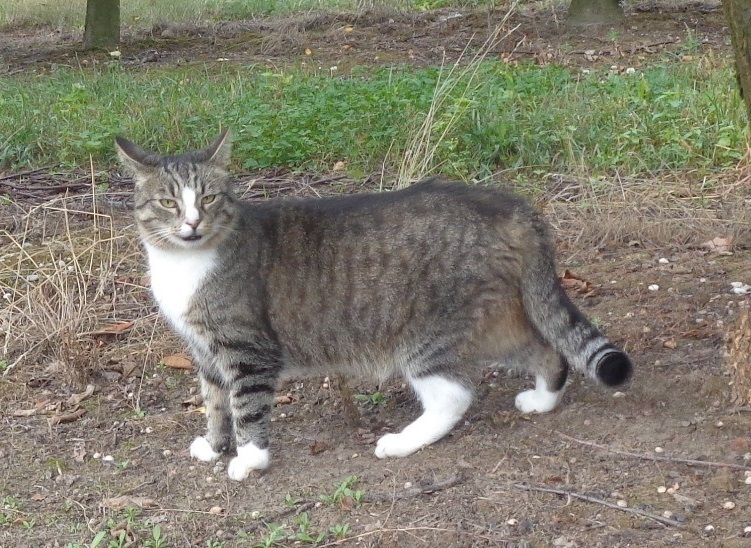 Hili: That after such a long walk I’m going to be hungry. Hili: Że po tak długim spacerze będę głodna. Barry says, “This is you doing gardening.” It would be even better if there were a duck there to eat the insects! See you in a while, folks! This entry was written by whyevolutionistrue and posted on September 5, 2018 at 6:30 am and filed under Hili Dialogue. Bookmark the permalink. Follow any comments here with the RSS feed for this post. Both comments and trackbacks are currently closed. According to Wikipedia ( https://en.wikipedia.org/wiki/Tottenham_Hotspur_F.C.#Support ) around a third of Tottenham Hotspurs FC’s supporters were Jewish in the 1930s. Today only about 5% of Spurs fans are Jewish (similar to the fanbase of other London football clubs), but rival supporters still use anti-Semitic slurs against them at football matches. The decision by some Spurs fans – Jewish and non-Jewish alike – to proudly call themselves the “Yid Army” in response to this has been controversial, although the then Prime Minister David Cameron defended it. In a Biography about Helen Bamber ,the author says a bit about Anti-Semitism in the 30/40s in GB.The daily hate were writing about aliens in 1941 ,meaning Jewish refuges from Europe not doing their bit for the war effort . Helen Bamber once rounded on a bigot in a bread line and told her about her aunt’s boyfriend who had been at Dunkirk . I think she says somewhere that Jews were not made welcome in the Air raid shelters . I do not think anyone can argue Heather’s assessment of Carter/Reagan. After all, look at this place today. Re the exchange between the young lady and the fossil ,i always suspected American repubs are the worst money could buy. Just so. If he’ll stoop this low on fossil fuel, what kind of Governor would he make on other issues? He’ll push the state in whatever money wants it to go. I would think Scott Wagner could get quite a bit of support if he courageously refused the $200,000 from fossil fuel. Wouldn’t voters find that appealing? As it is he stuck being very embarrassed because he can’t answer the lady’s questions. Why, I wonder, can’t republicans do the right thing? Former York County Senator Scott Wagner and running mate Jeff Bartos have both acknowledged the scientific consensus that the rapid warming is caused by man-made greenhouse gas emissions. […] at a more recent event in York, Wagner largely turned his responses away from what causes climate change entirely. After saying the debate is settled on climate change and that its been spurred by humans, he called a 100 percent renewable economy “not realistic” — noting he doesn’t want to subsidize clean energy. “If anybody thinks that, as governor, I could go into the governor’s office and flip a switch and change all this — I can’t,” he said. Instead of broader policy changes to address climate, he focused on infrastructure updates to handle new weather patterns—bringing up incidents in which, overburdened with heavy rain, Harrisburg’s sewer system allowed raw sewage to flow into the Susquehanna River. This is the new tune among many former climate change deniers – that ‘we’ adapt to the inevitable rather than become uncompetitive by addressing causes of climate change. Wagner on his campaign website makes a big thing about being a farm boy without a post-HS education. It’s a PLUS in WagnerWorld & I’m sure it appeals to the “working people” he keeps talking about ~ the multi-millionaire, multi-business owner is just one of the boys after all. No college? And he touts this as an advantage? Then he’s marketing sheer ignorance. The rise of populism seems to be what’s happening. The appeal to the uneducated class which extols anti-intellectualism, and often racism. Rather than consult experts who actually know what they’re talking about, let’s ask Joe Blow what he thinks and go with that. Wagner’s move to an acceptance of global warming is certainly an improvement, but I think he’s ignoring mitigation to please his paymasters. Koch doesn’t care if we invest in putting Manhattan inside a 50 foot sea wall, as long as we keep pumping oil. Yes. They know they’re dumb and they hate anyone who knows more than them and they want to believe they are somehow magically smarter than ‘clever’ people. True. And they think God provides for the existence of people who they can feel superior to. When a black man became president, they foamed from the ears. They’re now getting even with Tr*p.
Justin Wilson was great – I really should get his albums. I hated Ronald Reagan before he became president and my opinion of him only went down afterwards. Republicans love ignorance. Typical comments from the wackaloons on youtube . Best whale watching in California is with Sanctuary Cruises at Moss Landing. I always enjoyed Justin Wilson’s show. Yes, the shtick was corny but the food looked damn good! I have one of his cookbooks and have made quite a few delicious things from it! Looking forward to the California Chronicles from PCC(E). Bon Voyage Jerry. Because I find comparative anatomy fascinating, I will add that the pigmented leg skin is restricted to the hands and feet (in a glove-like fashion). Carter had his share of problems as president, but I think in his case it was a lot of the “fill the role and get changed”. But even with that – he’s so far away from the current occupant in almost every positive measure it isn’t even funny. What did Carter do to get elected? (Even if it was for one term?) Was it really just being “not Nixon/Ford”, as is commonly said? Don’t blame me, I voted for Ford. The real question to ask is what did Jimmy Carter do to prepare himself for the presidency. It was a lot, and done while flying below radar. You can read about that in one of his books (sorry, I can’t remember which one, and don’t have it handy at the moment). Jimmy Carter is a great man. And everyone should visit the Carter Center, especially if anywhere near Atlanta. I’ve thought about why Reagan was lionized, and I think its because he was so much more likable than Richard Nixon, thus rehabilitating the persona of the Republicans. He is also (over)praised for helping to end the Cold War, (The implosion of Soviet Russia and the help of Gorbachev are downplayed in this scenario.) and helped create a sporadic though unstable economic recovery. As for likable, that’s what people said about GW Bush, too – the “kind of guy you’d want to have a beer with”. I don’t like beer, so that was always a useless endorsement. (Of course, I’m not an American so it doesn’t matter.) But it is also a useless endorsement because – so what? I do think it was a good cop/bad cop thing they tried to do with Cheney.